A famous and controversial psychologist named Sigmund Freud came up with the term “Childhood/Infantile Amnesia” way back in 1910. According to Freud, people don’t remember most of the things that transpired during their early years because these memories are repressed. “Repressed” means we unconsciously tell our brain to forget about certain ideas or events because they have been “traumatic” for us in a way and we don’t like to experience the same kind of trauma anymore. In trying to explain childhood amnesia, researchers found that memories with high emotional value are most likely remembered and these events often take place in the latter part of childhood. For example, adults would more likely remember the memory when they had a sibling for the first time since it has a high emotional value for them. This indicates that toddlers may not have established much of this kind of association at their younger age. Unless the event has a huge impact on their emotion, it will not be remembered in detail. Neurologically explained, there might be certain parts of a toddler’s brain which may not be fully developed during that time. The brain’s ability to store and remember memories greatly lie in these two sections: the hippocampus and the prefrontal cortex. According to this theory, these parts of the brain are not fully developed until the child turns 3 to 4 years old. This explains why we have trouble remembering events that occurred prior to that age. The gamma-amino butyric acid or GABA is a neurotransmitter found in our body that has inhibitory effects on the brain. This theory implies that human beings have high GABA activity from infancy to toddlerhood, and this affects the way they store knowledge and experiences in their brain. There are studies to support that GABA may be linked to memory loss and this may explain why most of our early childhood memories seem non-existent. According to this theory, a toddler will remember his experiences by the time he develops a sense of his cognitive self. This means he will have to start thinking that he is a unique individual with unique beliefs and perceptions in order to have more meaningful memories of himself and his surroundings. This theory stipulates that a well-developed language leads to higher memory retention since a child will be able to create a “storyline” of the events in his mind. Some toddlers and younger children may not have completed their linguistic development and this might be the reason why they find it hard to store the events in their mind for longer periods of time. With the above examples, an individual will more likely remember the general facts about birds rather than the episodic event when he was two years old. Experts suggest that every event in our lives is first stored in our short-term memory. This acts like a “blank scratch paper” where we could input what we have learned, and retrieve it from there easily so that we could use it in some real-time, problem-solving tasks. An example of short-term memory is when we mentally add-up our paper bills prior to paying the cashier for goods. We remember the sum of it and we use it to verify if the cashier gave us the correct change. Long-term memories, on the other hand, are those remembered by our brain because we have been constantly repeating or doing it. Like in the above example, the long-term memory here is the way we do the math mentally. We’ve been practicing it since our elementary years, so our brain vividly remembers the process and stores it for long-term use. In relation to this, toddlers have yet to undergo the transition from short-term memory to long-term memory through repetitive experiences. 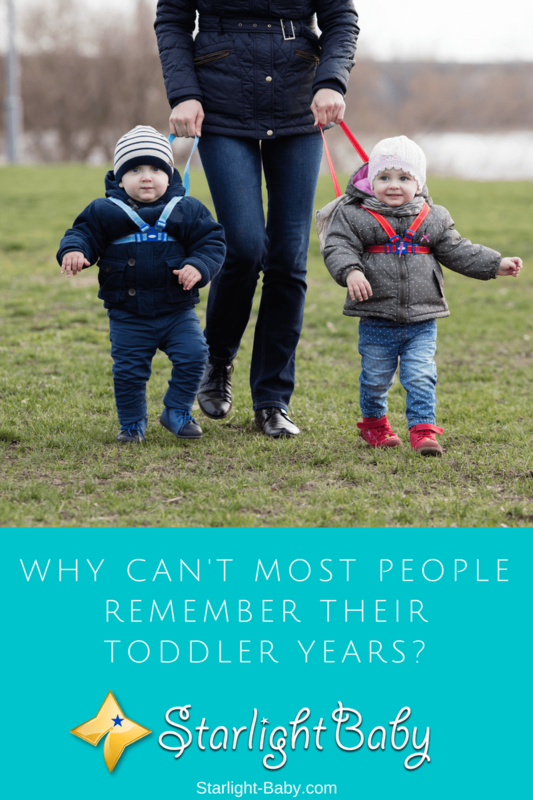 Hence, we are more likely to remember the activities we’ve been doing repeatedly since toddlerhood rather than the “one-time events” in our lives. For an instance, your uncle who is living abroad visited you once when you were 3 years old. He has not gone back again for years. You may more likely forget about this event when you grow up. You might have forgotten your uncle’s face, too! On the other hand, your family is fond of visiting your grandparents during weekends. You religiously do these weekend visits ever since you were a toddler up to the present. This is an example of a repeated event that you will more likely remember as you grow up. You might have more details about it, including the best desserts your grandma has offered you, the music that your grandpa used to listen to, and other similar, distinct concepts which you could relate to your weekend visits. If we can only bring back the past it is so sweet to be a toddler again. Our main task is to eat, play, drink our milk everyday and watch television with our parents. We don’t know nothing, that’s why all of us don’t care any responsibilities at all. Our brain is not fully develop yet and most of the time we get what we wanted because our parents care for us. Smile and cry, that is also part of our growth. There’s a big chance that you more than remember the bad memories compare to the good ones. Like me, I was bitten on my thigh because I accidentally step on the tail of our dog and I’m just only 5 years old.